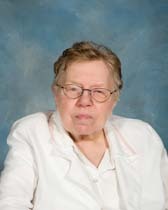 Sister Marian Steiner, a Sister of Saint Joseph of Philadelphia, died at Saint Joseph Villa in Flourtown, Pennsylvania on December 4, 2018. The Mass of Christian Burial was celebrated at the Villa on December 10, 2018. Marian was the youngest of three daughters born to Bridget and George Steiner. She lived with her family in Harrison, New Jersey. It was at the parish of Holy Cross in Harrison that Marian and her sisters Margaret and Agnes received their first sacraments and attended the parish elementary school. She had happy memories of her childhood—especially of her sister holding her hand while crossing the street on the way to school. The Sisters of Saint Joseph came into Marian’s life when she attended Our Lady of Good Counsel High School in Newark. After graduation Marian worked for a year at a manufacturing plant in New York. It was war time and Marian remembered some of her classmates and co-workers heading to war, but not returning home. It was during this time that Marian felt drawn to become a Sister of Saint Joseph. She entered the congregation on September 14, 1943—the feast of the Holy Cross. Upon receiving the habit she also received the religious name Sister Saint George. For the next twenty years Marian taught in parish elementary schools and diocesan high schools. In 1972 she requested to leave the Sisters of Saint Joseph and moved to Allentown, Pennsylvania where she found a circle of friends who loved and supported her during a time of transition. Ten years later Marian requested to re-enter the congregation and was welcomed home in August, 1982. Her favorite ministry in the latter part of her ministerial life was that of Assistant Librarian at Allentown Central High School. In 2007 Marian became a resident at Saint Joseph Villa with the ministry of prayer and presence. When we remember Marian we think of members who have been part of “The Greatest Generation.” They are women who lived through great changes in our world and in religious life. They taught us that actions speak louder than words, to nourish our prayer, to work hard in ministry, and to rely completely on Jesus.